During your first visit with us at Islington Bloor Dentist, we will perform a clinical exam and take an inventory of the overall health of your mouth and teeth to diagnose potential problems that you may have. During your exam, we will start by checking your face and neck. We do this to look for any abnormalities, such as lumps, bumps or swelling. Next, we’ll look inside the mouth to check for any abnormalities in your soft tissue, such as discolourations or ulcers on your lips, gums, tongue, palate and cheeks. We will also perform an oral cancer screening and check your bite and your jaw joint for any problems. Thereafter, we will check your gums and jawbone and look for any signs of gingivitis, gum disease and bone disease. Once the above issues are taken care of, we will check for cavities and other problems, as well as address any areas where you may be experiencing symptoms or have concerns. If you are interested in any Cosmetic Dentistry procedures, we will discuss all the options available to you at this time as well. Upon completion of your initial dental exam, a treatment plan will be established and your dentistry will begin. X-Rays are important because they help us understand what is occurring at a deeper level. For instance, an x-ray can reveal if there’s been significant bone loss or if gum disease is present. A clinical exam is not thorough enough to identify such issues so we use x-rays. The x-rays we take will also provide necessary baseline measures that we will compare to during future visits. 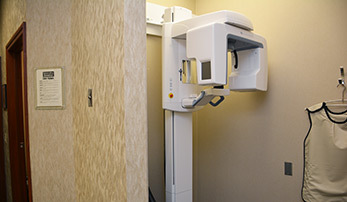 Our clinic features a Panoramic X-Ray machine, which has the capability to record an impression of your teeth and gums all at once rather than in bits and pieces, as is the case with traditional x-ray machines. With a panoramic x-ray, we can get a true view of entire mouth in one shot. Would you like to come in for a visit? Dr. Avila offers free consultations. Stop by the clinic and learn more about what we can do with your teeth. In the meantime, visit our Transformations Gallery to see first hand what cosmetic dentistry is capable to achieving.